Chris Paul’s hand injury and Blake Griffin's quad issues put a giant dent in the Clippers’ quest for an NBA championship. It’s virtually impossible for a team’s fortunes to flip harder and faster than what the Clippers experienced on Monday night. One day after Warriors guard Stephen Curry suffered a knee sprain that potentially opened the door for a Clippers trip to the Western Conference finals, Chris Paul sustained a third metacarpal fracture to his right hand and Blake Griffin re-injured his quad tendon. The Clippers announced Tuesday that Paul underwent surgery to repair the fracture and is out indefinitely and that Griffin will miss the remainder of the playoffs. On Sunday, the Clippers were sitting on a 2–1 series lead over the Trail Blazers when Curry slipped awkwardly to the Toyota Center court in Houston in a game against the Rockets. That injury, which is expected to sideline Curry for at least two weeks, immediately leveled the playing field for a potential second-round series between the Warriors and Clippers. With Curry, Golden State swept L.A. 4–0 during the regular season, but without him, Paul was poised to be the second-round series’s driving force and best player. By Monday night, however, Portland had evened its first-round series with L.A. 2–2 with a 98–84 victory in Game 4. Suddenly, L.A. had to stash its conference finals dreams in favor of a new nightmare: Its season could be over as soon as Friday. Can the Blazers or Hornets steal their first-round series? That’s no overreaction: Paul departed the Moda Center with his hand in a sling and cast, Griffin re-aggravated a left quad injury that he first sustained on Christmas and J.J. Redick continued to show the ill effects of a heel injury. Rivers turned to his son, Austin, and the 2016 Sixth Man of the Year Jamal Crawford in the second half. The two guards combined to shoot 5 for 22 on Monday and neither is truly equipped to run an offense in Paul’s absence. Indeed, the Clippers’ best all-around playmaker besides Paul was Griffin, but he was a shell of himself in this series and will now be sidelined for the duration. Signs of frustration given the terrible run of injury luck were everywhere: Paul kicked a seat cushion on his way off the court following the injury, Griffin fiddled with his knee and quad and Redick held his head in disbelief during the game’s closing minutes. Nevertheless, Rivers said his team pulled together in support of Paul following the loss. Paul, like Curry, fell victim to a fluky play. While defending a Gerald Henderson drive, his right hand contacted Henderson’s backside, and he immediately pulled it back in evident pain. He continued playing for one possession but immediately began favoring the hand after attempting one pass. Paul, also like Curry, has enjoyed an unbelievable season, averaging 19.5 PPG, 10 APG, 4.2 RPG, 2.1 SPG and ranking sixth overall in Player Efficiency Rating, fourth in Real Plus-Minus and seventh in Win Shares. The easiest way to visualize Paul’s value is to look at his impact on the Clippers’ offense when he’s on the court. This season, L.A. posted a 111.7 offensive rating with Paul in the game and a 98 offensive rating when he was out of the game. Put another way, the Clippers had the No. 2 offense in the league with him on the court (trailing only the Warriors) and the No. 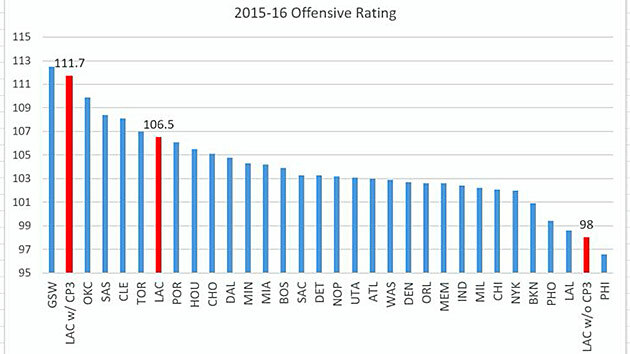 29 offense without him (better than only the Sixers). Before the team announced that it would be without Paul and Griffin, Rivers admitted that multiple tinkers to his starting lineup could be coming. The role reversal between the Warriors and the Clippers, these two Pacific Division rivals, over the last 48 hours is truly breathtaking. Just as L.A. was one of the biggest beneficiaries of Curry’s injury, Golden State is easily the biggest beneficiary of injuries to Paul and Griffin. Assuming the Warriors can close out the Rockets—they hold a 3–1 series lead with Game 5 set for Wednesday—the defending champions will face either a Paul-less Clippers team or the upstart Blazers in the second round. In either matchup, Golden State should be favored given that it boasts an elite defense, a proven and cohesive cast of experienced players and multiple All-Stars, even without Curry. Should Curry return midway through that series, as his initial recovery timeline suggests, the Warriors would immediately become heavy, heavy favorites over the Clippers and the Blazers. If you listen to almost any NBA coach this time of year, you’re liable to hear the words, “Never get too high or too low.” The Warriors and the Clippers stand as living proof.